Our main line was backed up and my laundry room had flooded. Again. Gross. Sorry for the photo, it had to be done. Y'all need to understand just how dire the situation was. We've had some issues in the past with our 50 year old home's main line to the sewer. 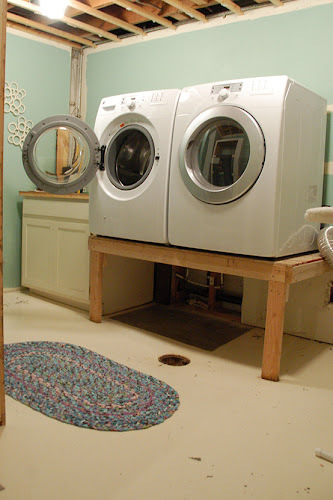 Shortly after we moved in, the floor drain would flood the room a little when we did laundry. Gradually it started flooding more each time... no good. We had plumbers come and look at it -- they climbed on the roof with a snake and cleaned it out, but they said some older homes just have problems like this that come back repeatedly, and worst case scenario we'd have to replace the main line (ouch! expensive!). I cried a little inside when they said that. A year and a half later it happened again and we called more plumbers. 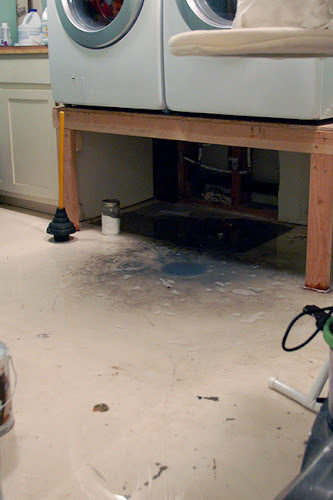 Even when the line was clear it was always slow, and I knew it was only a matter of time before I walked downstairs to a flooded laundry room again. 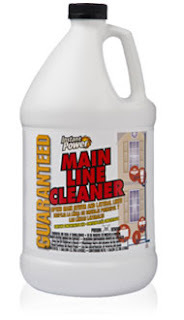 Both plumbers recommended a powdered enzymatic cleaner that is supposed to introduce enzymes (duh) and helpful bacteria to the pipes to really clean them out instead of just cutting a hole through the gunk like a snake would. Geek moment time out: think of your plumbing system as similar to your digestive system (sorry -- again, it has to be done). Helpful bacteria are necessary for proper function in your gut, and when you use a heavy duty chemical drain cleaner on your pipes or take an antibiotic for an illness, all that helpful bacteria gets killed too. This can lead to drains that clog again faster or in the case of our body, tummy troubles. So if you can solve a slow drain with an enzymatic cleaner and then do routine monthly treatments to keep it clear, it's a healthier alternative but it's also better for the system in general. Back to the story. I was using the enzymatic cleaner and it helped but it never eliminated the problem in the main line -- it seemed our issue was just too large. I cried inside some more. Instant Power's Main Line Cleaner. I started reading reviews about how it was some sort of miracle cleaner for frustrated homeowners. And I saw that it was guaranteed. I didn't want to get my hopes too high after hundreds of dollars spent on plumbers who couldn't fix it... but I still dropped everything to run to the store and pick up a bottle for $10. I brought it home and anxiously watched the clock until evening; see, just like an enzymatic cleaner, this product is best used when you're not going to be using sinks, showers, toilets, dishwashers, etc. for several hours -- overnight is perfect. Right before bed I poured the entire bottle down my laundry room floor drain and said a prayer to the plumbing gods. Fast forward to the next morning: I boiled a berzillion pots of water and trudged downstairs to flush the drain as per the instructions. I poured the first gallon into the drain... and it went down. It wasn't instant but the water... went down the drain... in front of my eyes. I was intrigued. It wasn't draining slowly, but it also wasn't draining incredibly fast... so I decided to test the line and see if I needed another bottle (as some reviewers said their lines needed two treatments). Mike and I turned on all the faucets in the house at once and flushed the toilets... and at first it looked like it was going to start backing up through the floor drain again, but then we heard a big gurgle and saw some bubbles from deep in the pipe like something was knocked loose, and the drain immediately emptied and never filled back up. My floor drain has been dry for a week, which is amazing. We've had zero back up, we can run the dishwasher and the washing machine at once, and my life is complete. Or at least I don't want to kick my house in its imaginary face anymore. Success! Can i use it in a clogged sink too? Thanks, Anna! I'm so worried about our new house. It was built in the 30s, and I'm pretty much taking it as gospel that we're going to have trouble with the pipes. You know... if we ever get to move into it. Aren't home renovations SUPPOSED to take six months? Anyway, at least we know what product to turn to now if/when we have problems! Hi Anna! I love your blog, so sorry to hear ur plumbing about your plumbing issues. We has the same issues. At first we thought it was tree roots, but that was only part of the problem. We finally had a plumber camera the line, we had a broken sewer line. If your problem continues, camera the line. I hope your problem is fixed. Best of luck! I poured the first gallon into the drain... and it went down. It wasn't instant but the water... went down the drain... in front of my eyes. I was intrigued. Wow! That is indeed a miraculous product that I have ever read of. I am quite appalled actually at first reading about the various experts you have hired to solve the problem for you but none of them knew exactly how to handle the issue. I have encountered a similar issue and one of the plumbers near Sydney recommended a similar product in a liquid form too. It is as a result of their high expertise level in this field that they managed to come up with a solution, unlike all the previous plumbers you have hired who were just out to get your money. Sometimes it is a matter of elimination before the cause of the blockage can be found. Working as a plumber I was called out a few weeks ago to a house that had sewage coming out of the drains and they seemed to be blocked. We checked but there didn’t seem to be any blockage that could be identified. Eventually we had to get a camera down there and could make out an object that turned out to be an old brush - the root of the problem. The Mike Wilson plumbing services have been in business for a really long time and it is the trusted family- run plumbing services that hails from Virginia. A damage cleanup services professional will have the necessary skills and experience to ensure that the problem is fully solved for good. The first real step towards becoming a professional plumber is undertaking the relevant plumbing courses. Plumbing requirements are varied and emergencies like burst pipes can happen in all setups, business and domestic areas alike. Basically there are three types of plumbing courses that you could enroll into Online calgary radiant heating Courses These types of courses can be applied over the internet.